Getting Started with Intermittent Fasting Today! If you’re looking for ways to lose weight and get in shape, you’ve probably heard of intermittent fasting (IF). An eating pattern that’s gained popularity in recent years, intermittent fasting involves alternating periods of eating and fasting (or significantly restricting calories). Not only has intermittent fasting been proven to help participants lose weight, but it has also been associated with increased energy, reduced blood pressure, and general cardio-protection. According to an article in Nutrition Journal, obese individuals who participated in alternate-day fasting lost weight and enjoyed heart-health benefits. IF can be a safe and effective option for weight loss when employed correctly. Fasting is NOT a new method but has been around thousands of years and used as an integral method for healing and prevention. Many ancient healers have considered fasting as the greatest self-healing remedy and is used by many religions throughout the world. Fasting is NOT “starving” as some people may say. Starving is an involuntary action with unhealthy results due to malnutrition. Fasting is a voluntary action with a planned eating pattern for health benefit gains. As long as I can remember, I had always been told that breakfast is the most important meal of the day. This couldn’t be any further from the truth. The idea that eating three times a day or the concept that six small meals are an ideal plan is a complete myth. Published data shows that ADF is an efficacious dietary method due to its ease of compliance, greater fat‐mass loss and ability to promote weight loss. Simply put, intermittent fasting is a regular eating pattern you adapt with both periods of eating and periods of fasting through the day. The idea is to reduce the amount of time you allow yourself to eat, thereby reducing the amount of calories, carbohydrates, and sugars you take in each day and helping your body to use the periods of fasting to convert already-stored body fat to energy, allowing you to shed weight. For example, instead of eating from 7 a.m to 7 p.m which is a normal 12-hour feeding window. All you have to do is change your eating window to 8 hours. So 12-8pm, 11am-7pm and etc. This is known as the 16/8 method, fast for 16 hours and have an eating window of 8 hours. When utilized responsibly, intermittent fasting can, in fact, help individuals lose weight and keep it off. While you might assume that people who follow this dietary practice are more likely to overeat during their non-fasting hours, research suggests this isn’t the case. In fact, according to a study from the British Journal of Nutrition, intermittent fasters consumed an extra 10 to 22% on feast days but reduced calories 28% overall throughout the week. So, they still ate less and lost more. Weight loss isn’t the only benefit associated with intermittent fasting. Studies prove that the dietary tactic can also help patients reduce cholesterol. According to a 2015 study in “Nutrition Reviews,” participants who engaged in alternate-day fasting—a practice that involves eating a normal diet on one day and fasting or consuming very few calories the next—reduced cholesterol by 10% to 21% over a 3- to 12-week period. Believe it or not, IF is also proven to fight inflammation. According to the Journal of Obesity, fasting has anti-inflammatory benefits for the neuroimmune system, something that a high-fat diet prevents. A buzzword in the medical community, inflammation has been associated with a wide range of health conditions, including diabetes, heart disease, and even certain types of cancer. If you want to protect the long-term health of yourself and loved ones, IF might just be the solution. 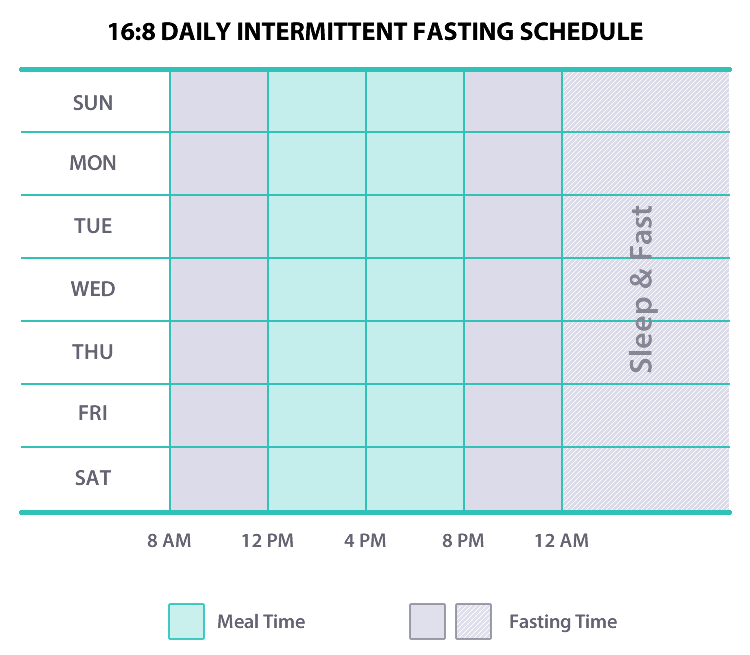 Time-restricted feeding (TRF) or 16:8 involves a set daily fasting period and shortened eating, for example, the 16/8 method involves daily fasts of 16 hours (14 for women). On each day the individual fasts for 16 hours each day and eats a normal amount of calories during the remaining eight hours, typically on the same schedule each day. Many prefer this process since it means that you’re eating the same way every day without experiencing the ups and downs. Whole-day fasting or 5:2 specifies various ratios of fasting to non-fasting days, such as the 5:2 diet. This involves eating 500-600 calories for two days of the week but eating normally the other 5 days. The fasting days are usually not back-to-back but rather spread out over the week. 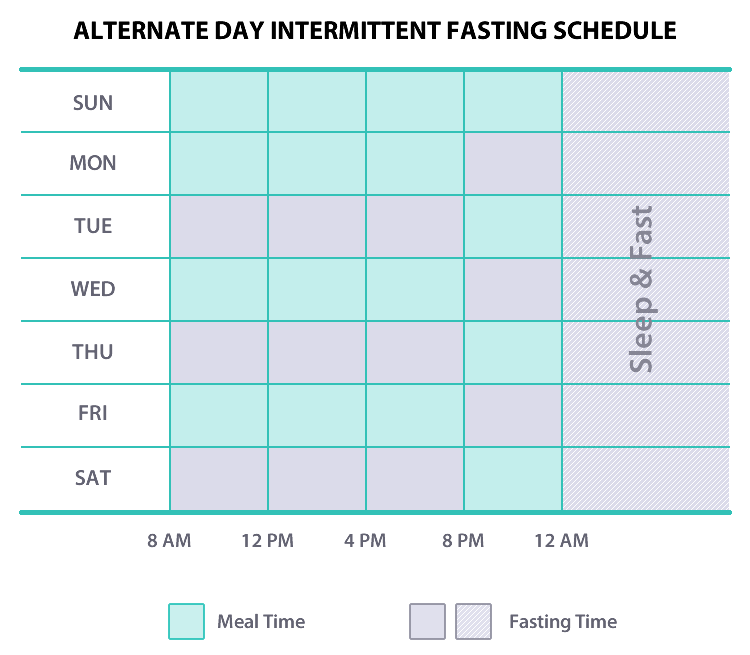 Alternate day fasting (ADF) involves a 24-hour fast followed by a 24-hour non-fasting period (eat on Day 1, fast on Day 2, eat on Day 3, fast on Day 4, etc.). Alternative-day fasting has a person consuming no more than 500 calories on the “fasting day”, and whatever they want the next. By choosing to fast for 23 hours with one meal per day, it allows for long fast periods on a consistent basis. As an added benefit, published research showed ADF may help with cardioprotection, protect memory and learning functionality, and help prevent several health issues. Of course, for all these options, it is important to eat healthy foods during your eating window. This won’t work if you eat lots of junk food or excessive amounts of calories. The main takeaway is that success relies on establishing a set “fasting” & “non-fasting” schedule and sticking to it for a period of time. Make no mistake about it, the first few weeks when fasting is going to be a tough challenge, both physically and mentally. This is BIG… and overcoming your inner Dennis the Menace is important to achieving the health benefits of Intermittent Fasting. Especially in the last few hours of fasting, both your mind and body will be screaming at you, “YOU NEED TO EAT!”. Don’t worry, your body has plenty of energy. All it happens is because it’s running out of sugar reserves and your body relies on this. It will be challenging but this is the most important since we need to push our body to use fat for energy and getting past our cravings makes this happen. Being mentally strong along with the right supplements and/or beverages can help get you through this important stage. Feeling low energy and less productive is common for most people start doing intermittent fasting, especially for those used to eat lots of snacks or meals throughout the day, and suddenly can’t. Besides, you may feel like you will have less energy or motivation to maintain your exercise habits. Don’t worry, it’s because your body hasn’t adapted to your new eating habit. Many give up intermittent fasting soon and miss out all the benefits of it, including weight loss, extending lifespan, supporting heart health, preventing cancer and so much more. Over-indulging is a common mistake for most people when they first start doing IF. I have to admit, I was guilty of this. After your Fasting period, knowing that what you eat is not as strict as other diets, you get into “beast” mode and eat like there’s no tomorrow. You need to have self-discipline and eat normally. After a few weeks, you will start getting used to it and find yourself eating normally… but you need to make sure at the beginning you control this. Otherwise, you’re contradicting what IF will do for you. When you do intermittent fasting, your metabolic rate goes down. Part of this is because of the muscle loss caused by weight loss. Besides, severe calorie restriction over a long period can cause your metabolic rate to drop, as your body enters the so-called starvation mode (or “adaptive thermogenesis”). Your body does this to conserve energy as a natural defense against starvation. WHY KEEP STRUGGLING WITH ANY OF THESE PROBLEMS? I am LOVING it!! So far it's working very well on me! No jitters, no side effects just not hungry. It does seriously decrease my appetite which I think is super helpful since I tend to be snacky. I love it! 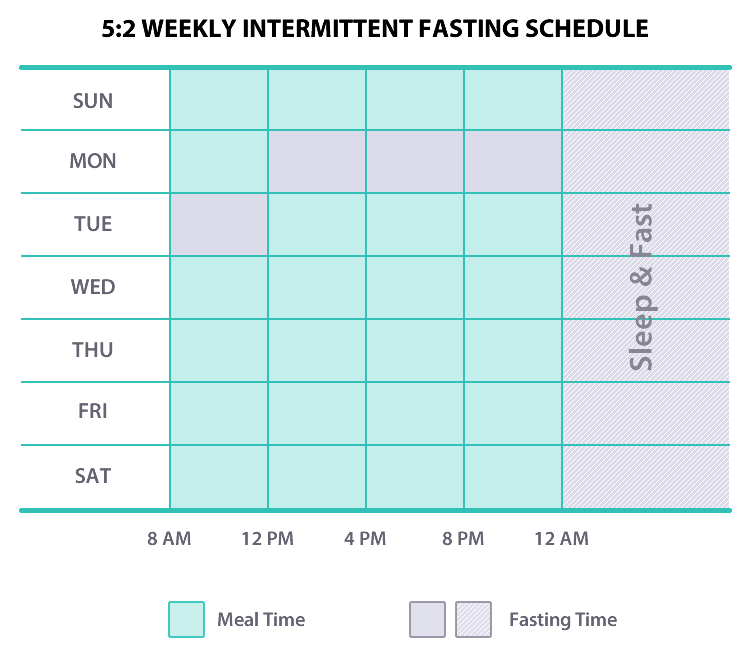 I chose the Time-restricted feeding (16:8) method of Intermittent Fasting as I felt it was the best schedule for me. 16 hours Fasting with an 8 hour eating period. My Fasting period from 8:00 pm to 12:00 pm the following day. I would eat from 12:00 pm to 8:00 pm each day. I started my mornings by drinking a 12 oz glass of water. 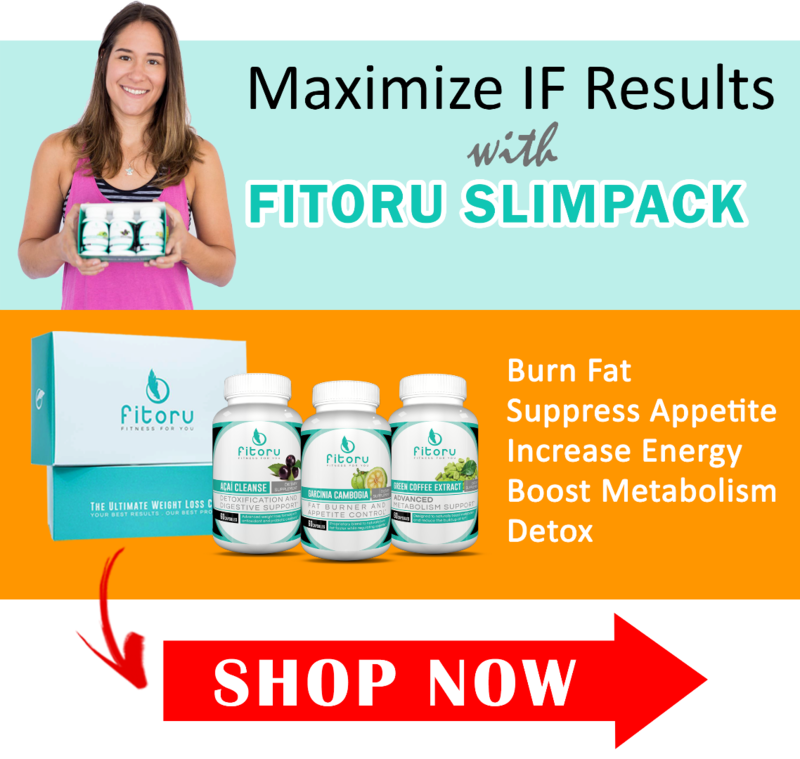 I would take an appetite suppressant a few hours later, Garcinia Cambogia by Fitoru which really helped suppress my appetite along with assisting with the fat burning process. I have to admit; this was my saving grace to getting past my food cravings some days. I would drink 2-3 cups of hot green tea before lunch. When I could, I would do some light exercises, e.g. a walk around the neighborhood or some exercises (bicycle kicks, side planks, lunges, etc.) at home in my living room. When I did work out, I tried to do it for an hour or two before my first meal at 12:00 pm. This allowed me to take advantage of accelerated fat burn during the crucial stage of Fasting. At 12:00 pm, I would eat a moderate meal like fish or chicken and vegetables. With IF, eating some fatty foods is welcomed so when it comes to chicken, eating legs and wings is just fine. Red meats (beef and lamb) are perfectly acceptable; I just don’t eat red meats. Throughout the day, I would snack on some nuts like almonds, fruits, or a cup of yogurt. 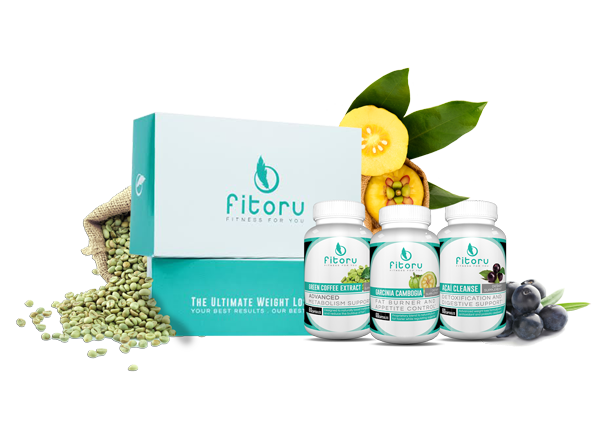 Right before my last meal, I would take the Green Coffee Bean Extract from Fitoru to get a metabolism boost. Shortly after this, I would eat my last meal (dinner). My dinners didn’t vary too much from lunch… fish (tilapia, salmon, sardines), chicken (grilled, baked) and salads/vegetables (grilled, steamed). Right before bed, I would take an Acai Cleanse supplement to detox and shed any excess waste from my system during the night. If this approach sounds interesting to you, as it did to me, give intermittent fasting a shot. In a short time, I was able to lose almost 20 pounds and improve my overall health. First, you have to be honest with yourself about your lifestyle and which type of intermittent fasting plan will best for you. I was looking for a program or process that could adapt to my busy schedule instead of me having to adapt to a diet plan. I did not have the patience or time for counting points or eating uninspiring pre-fabricated meals or creating special menus that were different from the rest of my family. I hope you’ll join me in my successful weight loss journey. *Intermittent fasting is not for persons under the age of 18 or those who suffer from eating disorders. Make sure to talk with your doctor before implementing a diet! The FTC requires all companies to identify what a "typical" result is. Unfortunately, most consumers leave the products they’ve purchased sitting on the shelves, or they don’t consistently and diligently follow the directions. To get results, one must take action! The images of people seen on this page are examples of "best results" using Fitoru rather than “typical” results. To achieve these best results, they worked hard, ate healthy, balanced and calorie-appropriate diets, and followed the suggested supplement dosage. Their lifestyles supported their weight-loss goals and worked with our supplements to produce results. It’s a full-time commitment to the program and to healthy living. Fitoru is here to help every step of the way.